Numerous reports have surfaced from LG V20 owners claiming that the glass covering the smartphone’s rear camera is easily shattered. In some cases, the glass reportedly breaks without any direct impacts, leading some to speculate that the LEDs may be the cause. Some users report receiving a new phone with glass that’s already cracked, while others indicate it cracks after only several hours or days of use. In addition to user reports on Reddit, smartphone durability tester ‘JerryRigEverything‘ experienced the same issue. 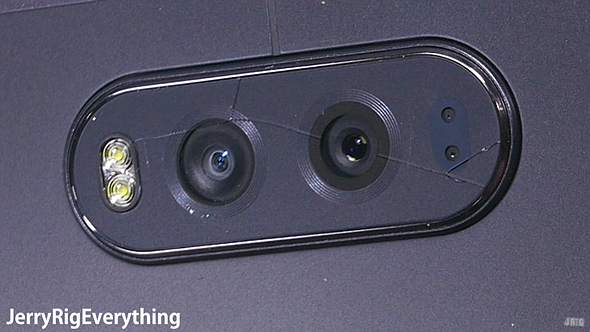 The glass camera covering is shown shattering in the video below a few moments after he rubs it with a pick to test its durability against scratches. LG has not issued a comment on the reported issue. For now, users are advised to keep the protective film covering on the camera glass in an effort to avoid cracks.